Health is an essential factor, and it should not be compromised in any circumstances. In this hectic schedule, to focus on health is really difficult, and in this contemporary era no one has time to stand in the long queue and to visit to doctors. To save time our developers have brought the enrich featured and high functional Online Doctor Appointment App for the Android and IoS. Synerion IT is known as the leading Doctor Appointment Software Development Company. Our certified developers offers you the robust and responsive medical appointment app for the patients and doctors. We have a melange of professional and dedicated team, who put their full efforts to deliver the painless experience app to patients, doctors and medical team. By the push notification, user can get the alert and updation of the Online Scheduling App including discounts, offers, deals and reminders etc. On our Online Appointment Mobile App, user can preview the analytics and know the number of user on the platform and view their activities. Our doctor Appointment App developers has integrated the video calling feature in the app, so patient and doctor have a discussion face to face. Users can pay the fees online to the doctors via different payment modes, we have interlinked the different payment modes with API such as Paytm, MobikWik, Google Play etc. Users can have a live chat with the doctors, as always video is not possible. For minor doubts they can have a interaction on chat. Users can contact at anytime and from anywhere, bookings are available on doctor appointment booking system for 24*7 hours. The hospital appointment app is user friendly, everyone can use it. It doesn’t require any specific skills or course. Everyone can use it, who knows to use smartphone. To manage data and records in imperative for the hospitals and clinics. Each and every case should be in records and doctor appointment software keeps it in a secure and organised way. The Online Doctor Scheduling app saves time of the human resources as the documentation and data management process is handled by it. The Doctor Appointment Booking App offer users to pay online via payment integration. Patients can easily book the appointments, with only one or two taps on the screen the appointment can be book. Patient can easily register on the panel patient scheduling system with the essential and basic details including name, Email ID, and contact number. User can search for the doctors easily with only one single click, they search the nearby doctors or with the name of doctor or hospital. It is easy to book the appointment directly with the doctor, with the suitable timing medical system scheduling can book the appointment with doctor easily. 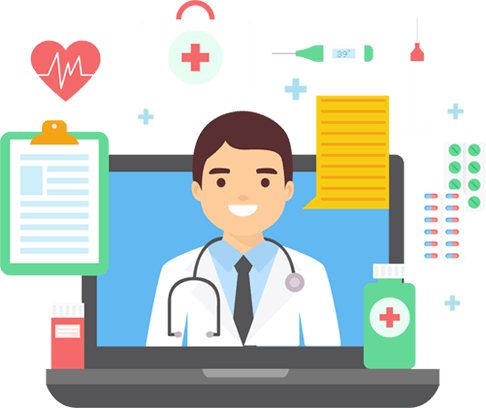 The medical app offer you an opportunity to have a online consultation for the health, it is not important to visit to the doctor clinic. With the medical app Android and iPhone, patients can have a live chat on with the doctors and discuss their issues and take advice on chat. Same as live chat, patients can have a video call with the doctors via medical app and have face to face conversation. As soon as patient search for the doctor and select the doctor, they get the notification request of the patient. After getting the request on the online medical mobile app, doctors choice to accept or reject the appointment. On the hospital appointment app, user can view an in depth patient details which includes, name, medical history, treatment etc. Doctors have full authority to the edit the schedule details of the patients as per their suitable routine. On the medical app, doctors can have the live chat with patients and suggest them the best treatment. On Doctors finder app, doctors can have a live video call with the patient can view the wound as well as of patient, It bring clarity and improve the communication part. Admin handles the patient’s profile which includes name, treatment history and all the records of patients on the doctors finder app. 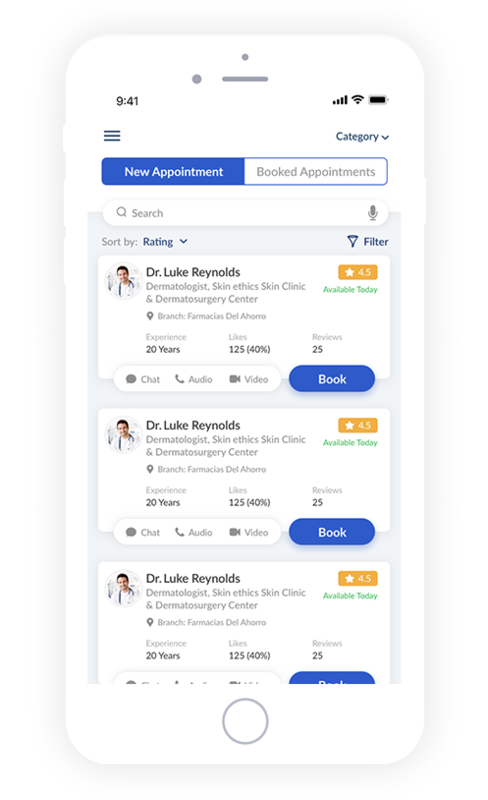 The doctor details including name, license, treatment, and all medical aspects details of a doctor is managed by the admin on the Doctors appointment app. Report is managed by the admin, the report system of patients is managed by the admin. The booking management is held on the online doctor app is managed by the admin panel. Process of informing doctor then again to confirm the doctors booking is manageable by the admin. Why Choose us as a Doctor Finder APP? 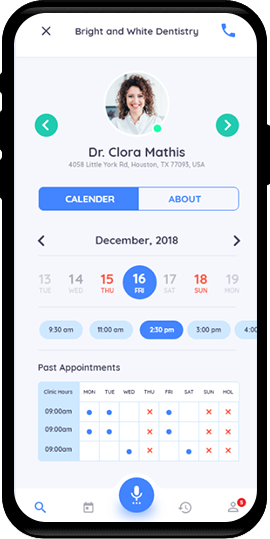 There are various reasons to choose us as a Dr Booking App Android and iphone but the major reason is we offer readymade doctor appointment app to our customers. Our readymade solution has all the features that a basic medical appointment app should have.